Fran and I had been farming for about 3 or 4 years (not including Fran’s years growing up on the farm) when we were taking a stroll on the Embarcadero in San Francisco. We lived in the city for several years in the late 1970s, had friends in the area, and just liked getting back up there when we could. We came across this interesting market that had just started and since we had just begun taking our fruit to a couple of markets, we were particularly intrigued. I remember talking to Fitz Kelly, a “neighbor” (farms about 4 miles south of us). but we did not know him well and may have met at that market. We found the market manager, Sibella Kraus, chatted for a while and found out how to apply. 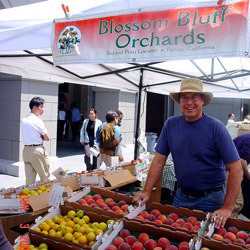 The market was located in the parking lot in front of the Ferry Building, then a neglected, partially boarded up building. We joined the market the next season (I guess 1994), when, as I recall, we shared a space with another seller, so we came every other week. That soon changed to every week. When we started farming (taking over the farm from Fran’s parents) in 1990, we had about 20 varieties of fruit. We started doing farmers markets in 1992, so we began grafting and planting more varieties. But in the early days, we had just several things to offer at any market and prominently displayed a large poster board with narrative and pictures that introduced customers to us and the farm. Bryce and Renata were in their early teens, and they and their two younger cousins, who also lived on the farm, all grew up making the trip to San Francisco to the Ferry Plaza Farmers Market. The youngest cousin, Trent, spent most of his early markets (when he was 8 or 9) inserting toothpicks into samples. He was very patient and focused (some kind of family labor exemption probably saved us from some cruel and unusual violation). There are a lot of good memories interacting with customers, trying to meet their and our desire for more and better stuff as our offerings expanded to close to 200 varieties, as well as memorable time spent with family preparing and on the road toward this common purpose. We have a lot of good memories and much appreciation for the role the market has played in helping us find a way to continue the family farm story.